It is a lightweight, compact MCA that works with USB bus power from PC, which realized semi-Gaussian waveform shaping function of spectroscopic amplifier by digital signal processing. Parameter settings such as shaping time and gain can be changed to programmable by computer. It has low noise, wide gain, programmable shaping time, and it is compatible with a wide range of detectors such as semiconductor detectors, proportional counters and scintillation detectors. Moreover, it is possible to obtain very stable high resolution with automatic gated BLR. Shaping time 0.25 μs or more. 0.625 and 0.125 us are not supported. A processor that executes separate in real time is installed in hardware! Connecting the boards further improves the output! The new product above was presented at the "The 2017 IEEE NSS - MIC" held in Atlanta from 24th to 26th November 2017 as a company presentation. For the products below, we have prepared a sample program so that you can use it in the program environment created by the customer. A corresponding model will be added in the future. Our Silicon Drift Detector (SDD) system has gained popularity from customers. This product XSDD50-04-25, the focal length of the specimen can be made as short as possible by the detector surface at 25 degrees, and the measuring method can be expanded. In addition to the excellent counting rate and energy resolution originally possessed by SDD, please enjoy the highest level measurement with the data measurement device APU504XGbE which developed by our development / design specialist at your X-ray beam line. It can be customized according to your request. Please do not hesitate to contact us for product details. We launched manufacturing and selling Silicon Drift Detector (SDD) system which is corresponding to the vacuum. This product has high counting rate and high energy resolution, and therefore it used by Synchrotorn radiation facilities and Photon factory in Japan. This system is possible to measure a light element such as a carbon, and it realize a high sensivity using more element of SDD. We desing and manufacture these kind of product by ourselves, so we customize a diameter and type of flange, the number of element, and the length of cylinder. Front APU101 is ALL-in-ONE digital spectrometer which has high-voltage power supply, preamp power, and MCA (Multi Channel Analyzer). Preamp signal of the detector is directly input to the APU101, and the digital signal processing is processed a high-speed ADC (100MHz, 14bit) and high-integrated FPGA. The measurement data will be transferred to the PC via Ethernet. of XSDD50-07 XSDD Series is ALL-in-ONE system which has detector, which is needed X-ray absorption microstructure measurement in the analysis of materials field, data acquisition board, and power supply. It was realized high-sensitivity by multiple SDD detector with high-count rate and energy resolution. Additionally, it is possible to be measured high-count rate by a transistor reset processing and DSP processing. ・Function: Histogram, List, Waveform, ROI-SCA. 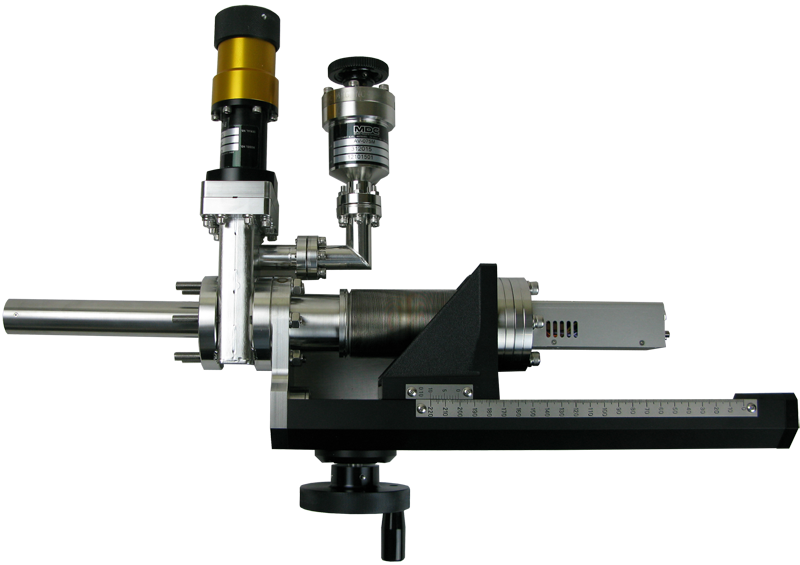 ALL-in-ONE Positron lifetime measurement is used for the measurement of vacancy-type defect of semiconductor in materials field. This is an all-in-one positron lifetime measurement system with measurement device and power supply. In the lifetime measurement, the life time is calculated by using 3 Gsps, which is imported by high-speed pulse signal from two BaF2 scintillators. In the Coincidence Doppler broadening (CDB), the 2D histogram is made by wave height value of coincidence from two Ge semiconductor detectors. Additionally, these devices can be combine to be measured by AMOC, which is the correlation of lifetime and momentum. ・Analysis mode: List (TDC + QDC etc. ), Wave, Histogram, etc. ・Use example: Gamma and Neutron discrimination and beta-ray measurement, high-speed / high-resolution scintillator, such as LaBr3, LYSO, etc. Front / Rear APN504X is a radiation measurement device with digital signal processing (DSP) for X-ray spectroscopy. APN504X does not use conventional spectroscopyamp. It directly input the preamp signal of the detector, such as SDD, Si(Li), SSD, SiPin, etc. And then, it does digital signal processing by high-speed ADC (100 MHz, 14-bit) and highly-integrated FPGA. The measurements data are Histogrum, List, and Quick scan. These data transferred to the PC via network. The application is attached without cost. Quick scan mode is a time resolution measurement. In this mode, it send histogram data to the PC by every outside trigger timing (Min. 10 ms), and PC saves data to an HDD consecutively. This mode is most suitable for the QXAFS measurement. PDF 15.7 MB This is a presentation file in "2014 IEEE-NPSS Real Time Conference (RT)".Not only the summary of the product but also you will find the description, etc. and measurement data and user case studies of basic performance. Please read by all means. Last Update: 22nd January 2019.